(CNN) -- The death toll from the suspected attack on the Dutch royal family has continued to rise as more details emerged about the man who slammed his car into a crowd during a holiday parade. 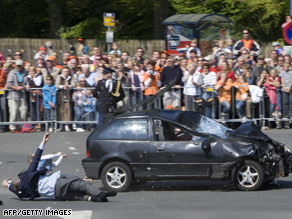 A car is pictured after crashing into the crowd waiting for the visit of the royal family in Apeldoorn. The Dutch defence ministry announced late Friday that a military policeman, 55-year-old Roel Nijenhuis, had died in hospital -- bringing the death toll to seven, including the suspected attacker. Twelve people were also injured in the attack. The driver, who has not been officially identified, died in hospital in the early hours of Friday from head injuries, as it was revealed that he had lost his job as a security guard and was about to lose his home. "Recently, he informed me that he had been dismissed and could no longer pay the rent," landlord Sem Bosman told De Telegraaf newspaper. "He was due to have come today to transfer the keys to a new tenant." The 38-year-old was described by his former landlord and neighbours as quiet, solitary, friendly, soft-spoken and a "dark horse," according to AFP news agency. Police searched the man's house but found no weapons, explosives, "or any other clues that could lead to the involvement of other people," police said. As the bus moved along, a small black car zoomed past it. The crowds were behind barriers off the road, but security officials and journalists, including many cameramen, were in the road as the Suzuki car went by. The car crashed into the low metal railing around a column on the side of the road. The vehicle appeared heavily damaged even before the crash, but the reason for that was unclear. There was no one other than the driver in the car at the time, police spokeswoman Esther Naber said. Members of the royal family saw the crash and gasped, then quickly sat down as the bus continued driving. The attack caused outrage in the Netherlands, newspapers Friday widely expressing disbelief and suggesting the monarchy would have to change. "Queen's Day will never be the same," the Trouw newspaper said. "The Netherlands always has been proud of their no nonsense royal family. With this comes a queen who not only cycles a bike, but also mixes with people without obvious security measurements. Is that still possible now the royal family has been the target of an attack?" The Algemeen Dagblad newspaper agreed. ""What is going to happen on the 30th of April next year? And will we continue to see the members of the royal family cycling through the canals of Amsterdam or hunting for bargains in the Bijenkorf in The Hague?" Queen's Day is a national holiday in the Netherlands, the Netherlands Antilles, and Aruba. The tradition started in 1885 and celebrates the birthday of the queen. Although Queen Beatrix's birthday is January 31, she officially celebrates her birthday April 30, according to the Dutch government. Queen's Day is known for its free market all over the country, where anybody is allowed to sell things in the streets. Other activities include children's games and musical performances. The day is marked with the color orange all over the country as a reference to the colors of the royal family, who come from the House of Orange-Nassau. Emmy Dexel contributed to this report.